In mid-2014, Wayne Sutton and I had an idea to bring people together in the tech industry to really help move diversity and inclusion forward. After nearly a year of building relationships, mapping the tech ecosystem, and working on curriculum that could help move the needle – we hosted our first conference and career fair. It was more popular – and more effective – than we could have dreamed! The two-day two-track conference and career fair sold out with standing room only. The packed hallways of Galvanize brimmed with brilliant people who were collaborating, sharing best practices, hiring new talent and laying a path to change. We created something special and we felt it. We are still learning amazing results that have come from that conference in September 2015 – new diverse hires, significant culture changes, personal and professional life changes to focus on diversity and inclusion, and so much more. In 2016, we’re going bigger and further. And we’re proud to announce we have a partner that is equally excited to go there with us! Google for Entrepreneurs will be a naming partner for our 2016 Tech Inclusion New York and San Francisco events. Tech Inclusion: in partnership with Google For Entrepreneurs. It has a nice ring to it! We’re excited to join Google’s community of organizations working to elevate entrepreneurship and inclusion around the world. With a commitment to diversity and inclusion, Google for Entrepreneurs is an ideal partner for our work in exploring innovative solutions to diversity and inclusion across the tech industry – which spans education, workplace, entrepreneurship, policy, and ecosystem development. Together we can create a truly inclusive tech world. 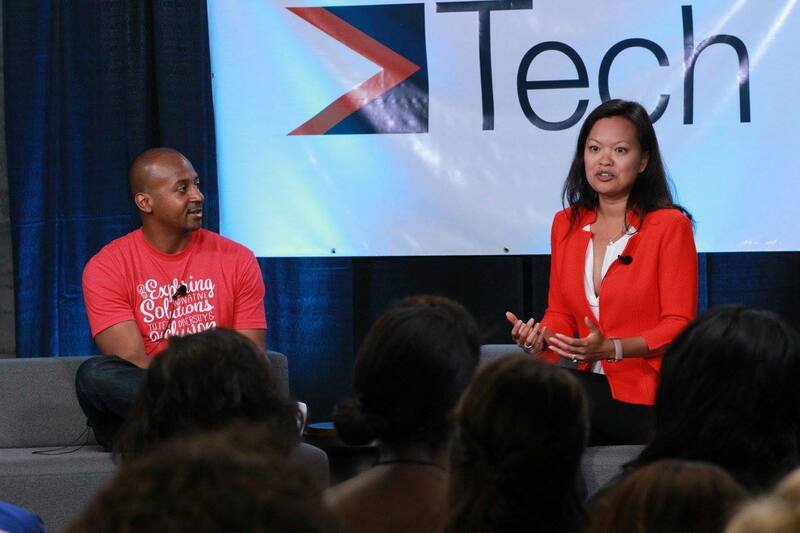 Mary Grove, Director of Google For Entrepreneurs with Wayne Sutton, Co-Founder Tech Inclusion at Tech Inclusion 2015. Google for Entrepreneurs provides financial support and the best of Google’s resources to dozens of coworking spaces and community programs across 125 countries. We also create Campuses: physical hubs where entrepreneurs can learn, connect, and build companies that will change the world. To learn more about Google for Entrepreneurs, visit google.com/entrepreneurs or follow us on G+ (+GoogleForEntrepreneurs) and Twitter (@GoogleForEntrep). Tech Inclusion is an initiative of Change Catalyst exploring and developing innovative solutions to tech diversity and inclusion. We partner with the tech community to solve diversity and inclusion together through conferences, career fairs, strategic consulting and training. Our work spans the full tech ecosystem, including: Education, Workplace, Entrepreneurship and Policy. To learn more about Tech Inclusion, visit TechInclusion.co or follow us on Twitter (@TechInclusionco ).